Penelope's Pad: You Should be President! Moses(randomly at dinner): Dad, you look like a kidnapper! We've been having a problem with kids saying they've cleaned up when they actually haven't so I did the ole pick-up-all-the-kids-mess-in-a-garbage-bag-and-put-it-in-the-trash (to be secretly retrieved later) trick. Then I served BLTs for dinner. Moses moped at his plate and moaned, "This is the baddest day ever!" From my vantage point, the kindergarteners look pretty well-behaved on the bus. They're all packed into the rows at the front, blandly staring out the window when it pulls up. But apparently, they've been having problems because the bus driver came up with the brilliant plan to let kids who are good sit where ever they want on Fridays. This Friday, when the bus rolled up, half the kids were staring at me from the very back few rows of the bus and the other half staring from the very front few rows. Herbie: Mom, do you know why I took a long, long time to get off the bus? Because I was in the very, very, very back! Ruby has big plans and big ideas. Some of them are about Halloween (usually involving Harry Potter these days); some of them are about the awesome crafts she's going to make (usually involving our discarded boxes, cartons, bags, etc. ); and some of them are about the future. One of her favorites is the plane that she's going to fly with her friends Jonas and Jade. There will be a swimming pool, and Ruby will be co-pilot. Jonas will be pilot, but he'll need Ruby to help out because he and Jade will be married, and when they have babies Jonas would also like some time off. She also, one time, told us that she'd like to be married to the President of the United States. Woo: Ruby! You should be President! Ruby: Girls can't be President! Woo: The feminist in me is outraged! Of course, you can be President! Ruby (giggling): Ok, I'll be President! This led to a discussion about the requirements for being President. Guess who's almost old enough? Ruby: Mom! You should be President! 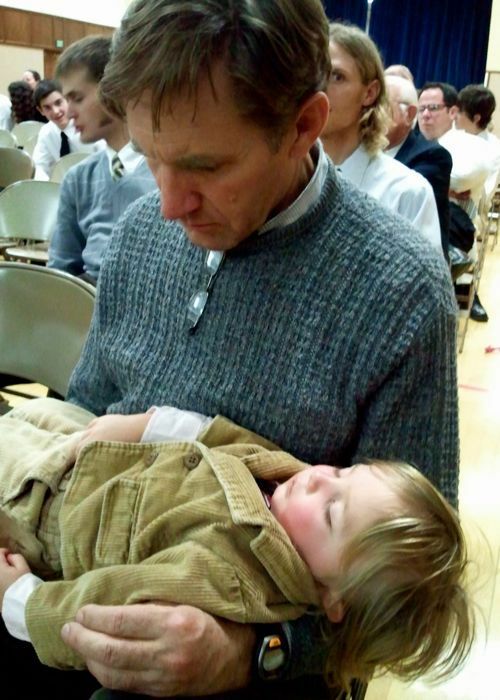 Linus and Grandpa taking a siesta in church. Anyway, that's it for the week. What do you guys do with all your kids' junk after you collect it? Any one thinking of running for president?